Yesterday, the Senate Finance Committee held a public hearing on SB548: legislation to take trash incineration out of Maryland's Renewable Portfolio Standard and stop giving it subsidies intended to support the development of wind, solar, and other renewable forms of energy. With a team of Baltimore City and Anne Arundel County residents, we spoke out about the air quality, health, and climate impacts of trash incineration, and the reality of zero waste alternatives like composting, recycling, and source reduction. We also delivered a letter from 25 Maryland organizations calling on the Senate to pass SB548 - read it below. 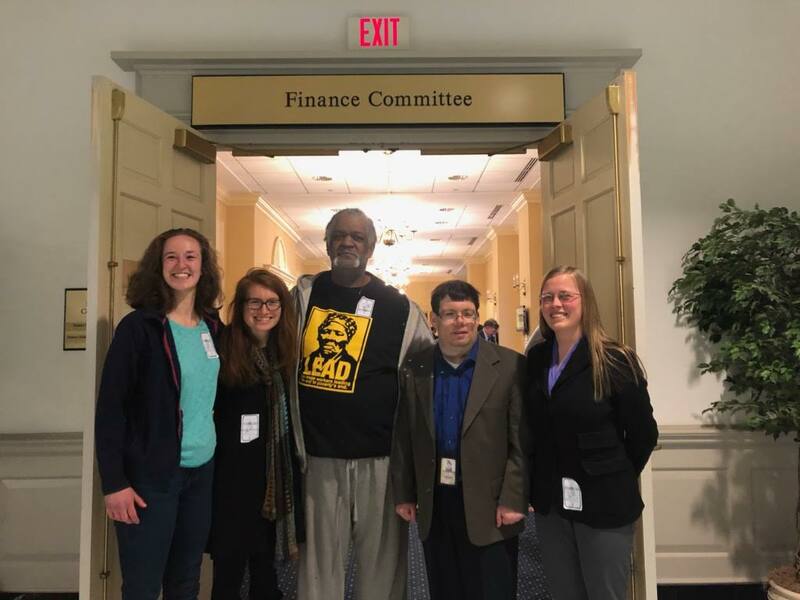 As 25 Maryland-based organizations working to support the health, environmental wellness, economic well being, and climate resiliency of Maryland communities, we urge you to vote yes on HB961/SB548 and end the practice of subsidizing trash incineration as “clean energy” under Maryland’s Renewable Portfolio Standard. Burning trash cannot be considered clean energy, and Maryland ratepayers can no longer be required to subsidize facilities that pollute their communities. Transitioning to truly renewable energy and alternative methods of waste disposal will create more jobs in Maryland, and this is a transition that our communities are ready to make. Trash incineration contributes to the air pollution in Maryland that causes chronic illnesses among Maryland residents. In Baltimore City, this phenomenon is most evident through the burden of asthma patients. According to an Environmental Integrity Project report, the average rate of asthma-related hospitalizations in Baltimore City is approximately twice the average rate of Maryland and three times the average rate of the United States. Even worse, there is a distinct association between asthma hospitalization in Baltimore city and median household income. Additionally, asthma is the greatest cause of school absenteeism in Baltimore. Children with asthma face the greatest health challenges, due to their more vulnerable physiological states. The youngest in Baltimore City are hospitalized at higher rates than other age groups. Nitrogen oxides (NOx) in particular is the primary pollutant that contributes to the formation of ground-level ozone, or smog, and the Baltimore area has long been classified as the U.S. EPA as failing to meet federal ozone standards. The BRESCO trash incinerator contributes to this problem, emitting over 1,000 tons of NOx pollution annually. NOx also contributes to the formation of fine particles, a pollutant that has been associated in studies with premature death from heart and lung disease, and is a serious trigger of asthma attacks. According to a Chesapeake Bay Foundation commissioned study, fine particulate matter emitted from the Wheelabrator Baltimore “waste-to-energy facility” causes over $55 million in adverse health effects annually. The Montgomery County Resource Recovery Facility is the second largest air polluter located in Montgomery County. This facility produces approximately 740 tons of air pollutants and sends 180,000 tons of toxic ash to landfills in Virginia. Air pollutants from waste incinerators have also shown to increase the risk of pre-term births, and lung and blood cancers. An Environmental Integrity Project assessment shows that the Montgomery County and Baltimore City incinerators emit higher levels of mercury, lead, nitrogen oxides (NOx), carbon monoxide (CO), and carbon dioxide (CO2) than coal plants. In Baltimore, Montgomery County, and throughout the state of Maryland, trash incineration contributes to air pollution that harms residents’ health; those residents should not be required to subsidize this pollution through the Renewable Portfolio Standard. When incinerators burn trash, they emit more greenhouse gasses per unit of energy generated than even coal, the dirtiest of fossil fuels. In 2015, the Wheelabrator Baltimore incinerator emitted roughly double the amount of greenhouses gases per unit of energy produced, on average, by each of the 7 coal plants located in Maryland. The Dickerson trash incinerator in Montgomery County produces 500,000 tons of greenhouse gases that contribute to climate change. Climate change poses multiple threats to Maryland residents, including increased precipitation, more frequent and severe flooding, and rising summer temperatures that increase outdoor air pollution levels. The financial support that Maryland’s Renewable Portfolio Standard provides must be used to support the development of new renewable energy projects that will help Maryland face and fight climate change, not to prop up aging trash incinerators. Maryland’s Renewable Portfolio Standard (RPS) was enacted in 2004 to facilitate a gradual transition to renewable sources of energy. Because of its impact on public health and on climate change, trash incineration cannot be considered renewable energy. According to the Department of Legislative Services’ analysis of this legislation, about 10% of Renewable Energy Credits in 2017 were from trash incineration. If applied to other Tier 1 renewable energy sources instead of incineration, these credits would support new high-paying Maryland jobs, increase GDP due to construction of new Maryland-based renewable energy infrastructure, and reduce Maryland’s carbon emissions. Truly clean, renewable energy creates jobs in Maryland. The State has more than 218 solar companies and over 5,400 solar jobs. The wind industry has brought more than $380 million in private investment into Maryland’s economy, to date. These jobs in clean renewable energy lead to good-paying careers within these industries and across related economic sectors. New clean energy development made possible by removing “waste-to-energy” incineration from the RPS, and therefore making credits available to other Tier 1 energy sources, will further support the development of these economic sectors in Maryland. Likewise, other methods of waste management such as composting, recycling, and reusing materials create more local jobs than trash incineration. According to the Institute for Local Self-Reliance, per ton of waste processed in Maryland, composting already “employs two times more workers than landfilling, and four times more workers than incineration. On a per-capital-investment basis, for every $10 million invested, composting facilities in Maryland support twice as many jobs as landfills and 17 more jobs than incinerators.” A similar study projected that within three years of increased recycling rates, “Baltimore could have 500 new direct jobs in this sector of the city’s economy;” overall, recycling and composting yield five to ten times more jobs than trash incineration. Likewise, for every 10,000 tons of materials that are managed through reuse programs, 75 to 250 jobs are created. If investments were focused on more environmentally-friendly methods of waste disposal, more jobs would be created in Maryland. As the only municipalities in Maryland that contain trash incinerators, Baltimore City and Montgomery County are working actively to increase recycling and composting rates and transition away from trash incineration. Baltimore City Mayor Catherine Pugh has pledged to close the BRESCO trash incinerator and increase recycling and composting rates, a commitment the City Council has echoed. In April 2017, the Baltimore City Council passed a resolution calling for Baltimore to “develop an effective, long-term, plan to move toward Zero Waste to support the continued health, well-being, and prosperity of our residents.” Then in January 2019, the City Council passed a resolution calling on the General Assembly to remove financial incentives for trash incineration in the RPS. City plans back up this commitment to transition away from trash incineration. Baltimore’s 2019 Sustainability Plan includes the goal of diverting 90% of the city’s waste from incinerators and landfills, and this is an achievable goal. According to the Baltimore Office of Sustainability’s 2014 report, “Waste to Wealth: Baltimore Waste Stream Analysis,” 82 percent of Baltimore’s household materials could be recycled or composted. Montgomery County has made a similar commitment to ending incineration. Montgomery County Executive Mark Elrich pledged repeatedly during his campaign that if elected, he would close the Dickerson incinerator by 2022, and has reiterated that promise since his election. Likewise, Montgomery County already has a goal of increasing its waste diversion rate to 70% by 2020 and has made strides toward increased recycling and composting. Other Maryland communities are actively pursuing robust composting, recycling, and repurposing programs with the goal of reducing waste. Frederick and Carroll Counties, since rejecting the construction of a new incinerator in 2014, have made significant strides toward zero waste. In Carroll County, New Windsor is piloting a “pay as you throw” program that, as of January, resulted in a 44% decrease in solid waste. Frederick County created a “What’s Next” Steering Committee to investigate alternatives to the rejected trash incinerator. In the words of one committee member, “the legislative, budgetary, and regulatory gears are moving Frederick County toward pilot programs and public education, and ultimately to a robust diversion of organics from landfilling, with the added tremendous benefits of producing compost from the organics to amend our soil on farms and elsewhere.” Prince George’s County hosts the East Coast’s largest composting facility and boasts the highest waste diversion rate in the state. Communities across Maryland are working actively to develop the recycling, composting, reuse, and reduction programs to manage waste streams in ways that are less polluting and more cost-effective than trash incineration. All Marylanders have the right to breathe clean air and no one should suffer health and environmental challenges because of where they live. The state should not subsidize incineration as clean and renewable energy, making it more profitable to pollute our communities and environment. We strongly urge the passage of this legislation to protect the health of all Maryland communities and steward environmental protections for our state. Turner Station Conservation Teams, Inc.